It is a naturally occurring fat, derived from the nut of the Karite Karite tree (Butyrospermum parkii). Karite oil is used for cooking; the butter is used for cosmetics. We trade directly with the women who hand-process the butter using traditional methods. This ensures that we get the best quality product and they get the best deal. We believe fair trade should mean something. The vegetable butter has a high lipid profile, also containing beneficial phytochemicals (vitamin A). Topical application of vitamin A (known as retinol) helps to maintain youthful appearance and healthy skin. Compounds within the butter have been shown to offer some protection from UVB rays. The butter contains oleic acid (an omega 9 monounsaturated fatty acid – lipid). This substance is beneficial for external and internal health. Oleic acid is highly compatible with human skin and with the sebum we naturally produce to protect our skin’s surface. It absorbs readily and aids the absorption of other active ingredients. 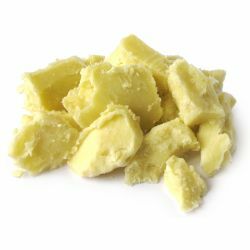 Shea butter is moisturising, emollient and softening on skin and it is so gentle that it has been traditionally used in Africa for baby massage. In None of your beeswax Lip Balm the butter conditions the lips and allows the absorption of its many beneficial qualities, as well as those of the other active ingredients.